Headlines: The return of some cooler weather has done wonders for the local lakes and rivers. Water temps in the lakes have dropped significantly and the fish are on the chew in a big way. Rivers:- Continues to be excellent with reasonable flows throught the mountain streams. Fishing has been quite good though polaroiding has been tougher with the overcast conditions of late. 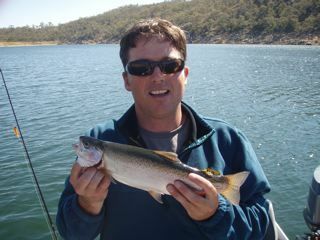 Lake Eucumbene:- The lake has cooled enough for the fish to start working the edges again. Mudeye patterns on dark are producing some nice fish. The bottom end of the lake is the best bet though there have been a few reports from the Adaminaby and Anglers Reach area also. Mudeyes have been hatching in numbers and the fish are starting to feed on them. 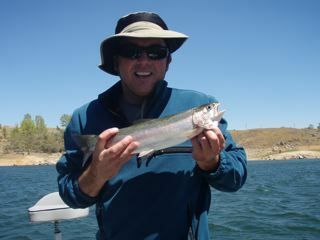 The Rainbows in the lake still in excellent condition and are fighting hard. Lake Jindabyne:- No Reports from Jindabyne again this week. There should be a few mudeyes around to attract fish around the edges. 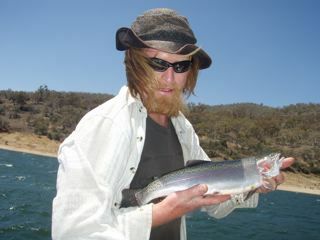 Eucumbene:- Trolling has been good with downrigging, and lead core still producing more fish. Top water and shallow run lures are catching a few more now with the improved water temp. Spinning off the bank with Celtas, Tassies, Snowy Minnows will pull a few quality fish this week. Canberra Killer, David with 5 fish all on the Pink and Purple (Tassie), Davids first Bag limit for the day, he was a pest on the way home! *Johnny 'Scrubworm' Pene and the Palmano boys have had a couple of blinder sessions with the mudeyes last weekend. They landed fifty four fish in two nights between five anglers. They released a big number of these that were a smaller 35cm class of rainbow, but still went home with some big fat fish including a couple of browns. Definitely worth soaking a mudeye under a bubble at the moment.